Not only should your master bathroom be like a retreat at the end of the day, it should be a fully functional, aesthetically pleasing space that takes advantage of every square foot. This is something R.J. Tilley achieves for people every day! 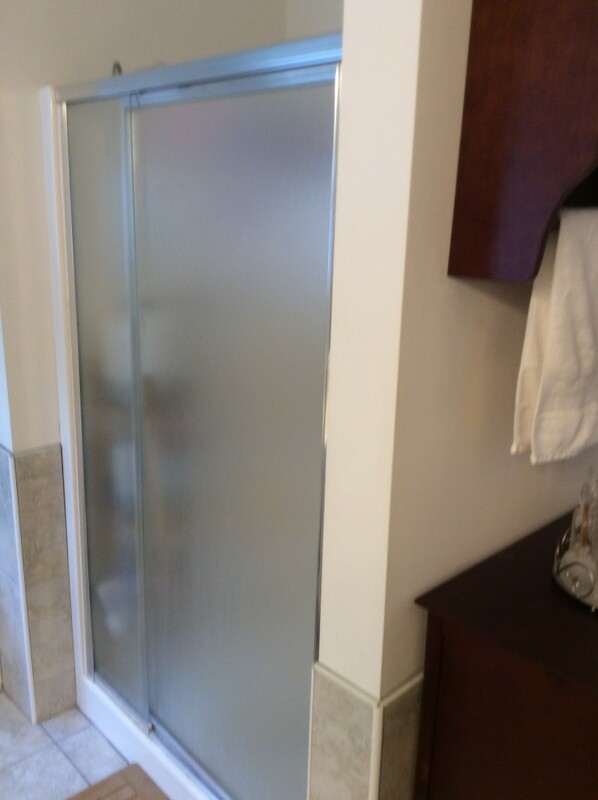 So, when our client, a homeowner in Mechanicsville, VA, called on us to remodel their master bathroom, we were up for challenge. 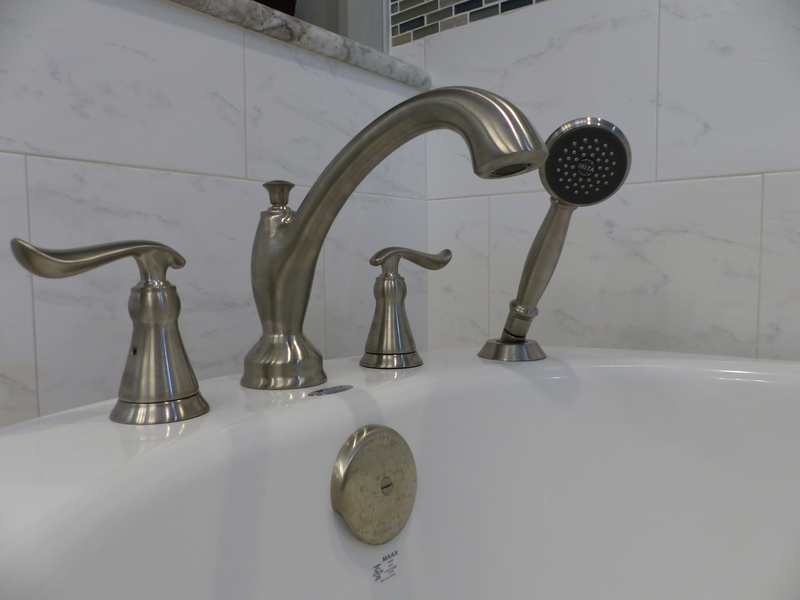 The existing master bath no longer meets our client’s needs, and they’re ready for a change. 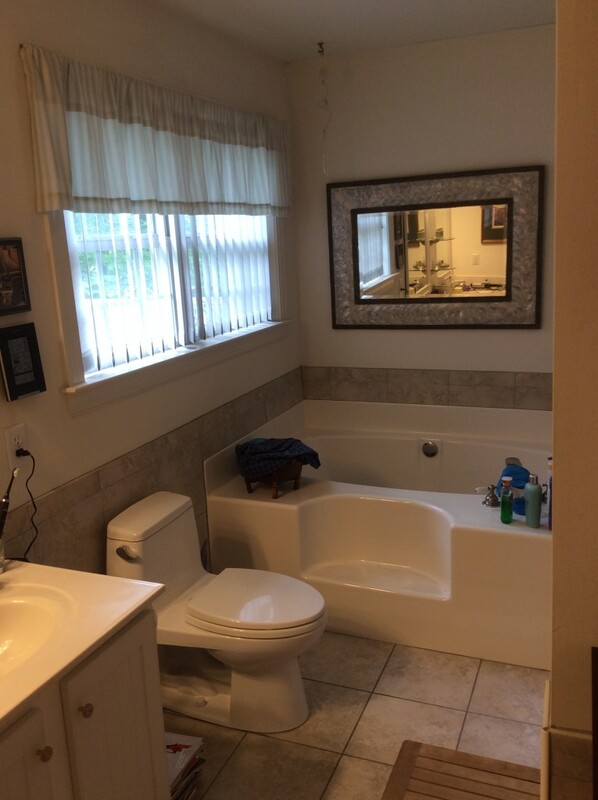 Like many homeowners with soaking tubs, it doesn’t get used often and takes up far too much space. The small, basic shower stall on the other hand is used daily, but looks old. 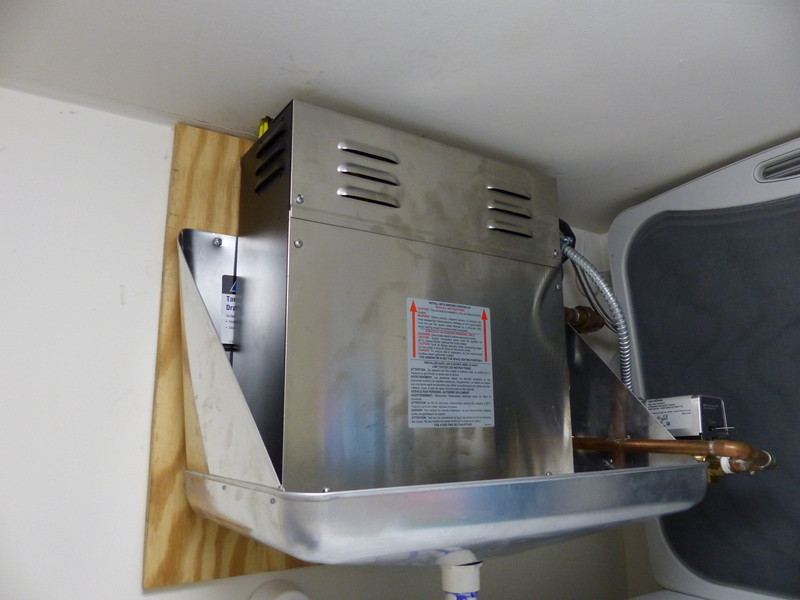 Fixtures and vanities are outdated and the overall layout of the bathroom just doesn’t work. 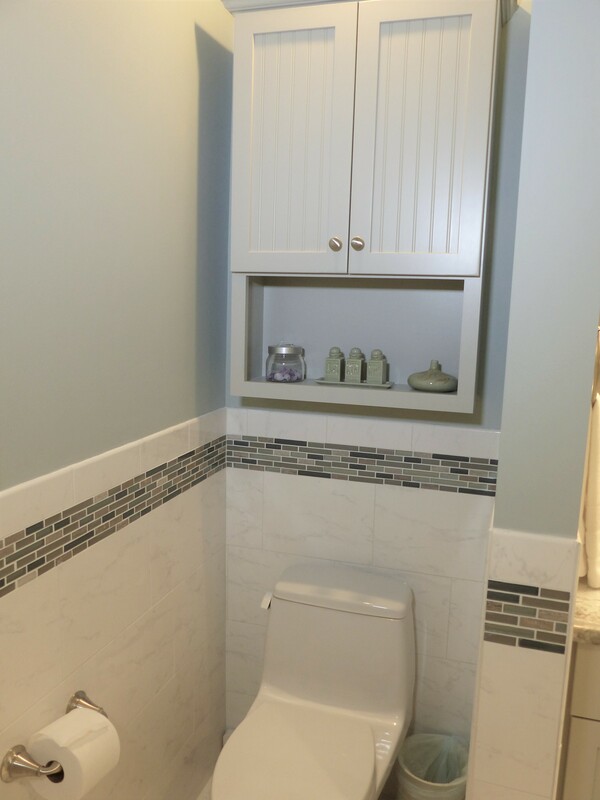 The homeowners want a bathroom that delivers an upscale, spa-like experience, while also providing usable space for every day use. When outdated fixtures are crammed into a tight space the result is a master bathroom that lacks appeal and functionality. The R.J. Tilley team was ready to change that for good! 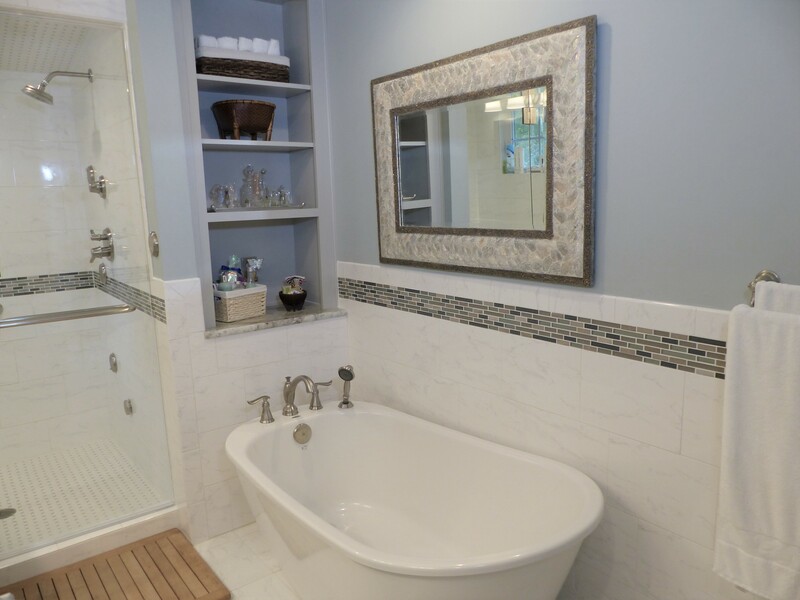 The large soaking tub takes up precious real estate in this master bath. Since the homeowners don’t use it much, we’ll use our design skills and make better use of this space. The compact shower stall is dark, narrow and really showing signs of its age. 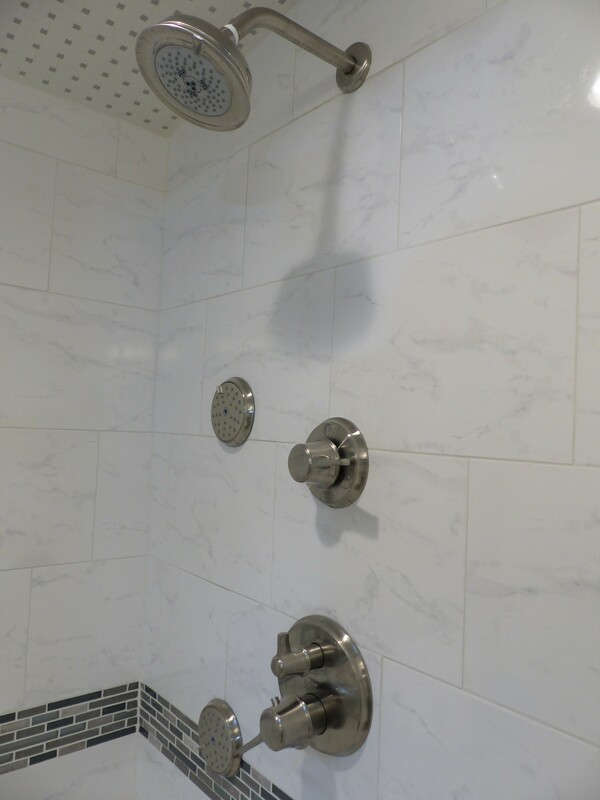 The homeowners use it regularly, so the bathroom remodel will focus on a more visually appealing, usable shower. 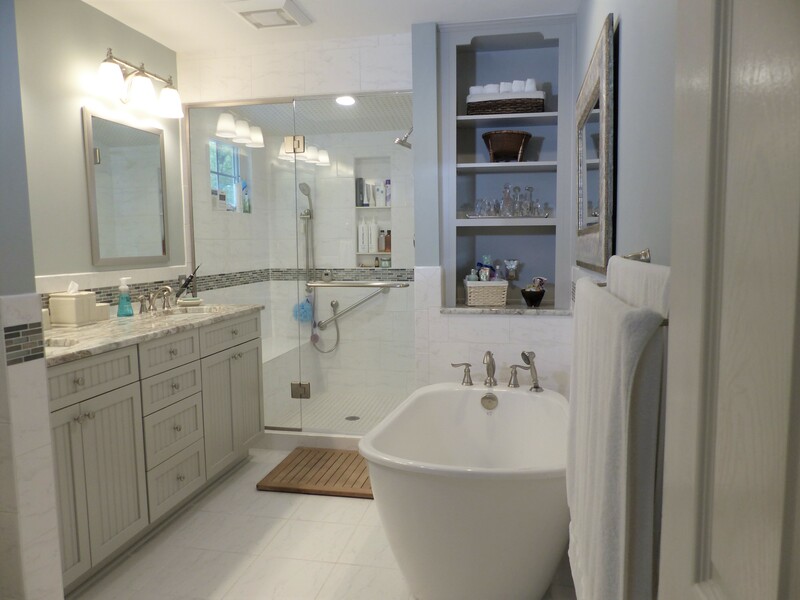 In this master bathroom remodeling project, our experienced team of designers, plumbers, and carpenters put their skills to the test as they completely rebuild and expand the bathroom. Focused on providing the modern conveniences and contemporary flair these homeowners were after all while enhancing usable space—this was a project we were anxious to get underway! Let’s get this bathroom remodel started! 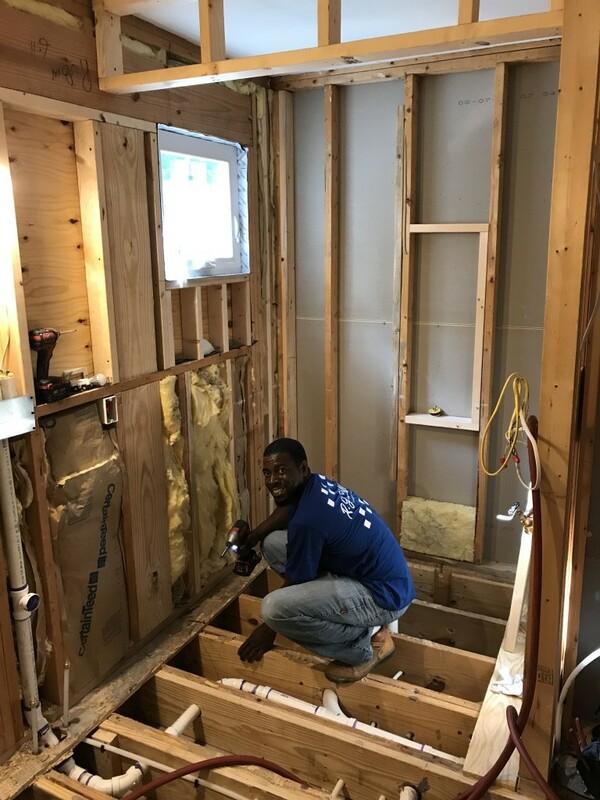 Check out these in-progress photos to see our team in action! Here, the plumbing is all done, and the shower is starting to take shape. After the subfloor is reinstalled, we can begin to lay the cement board required for the new tile shower enclosure. 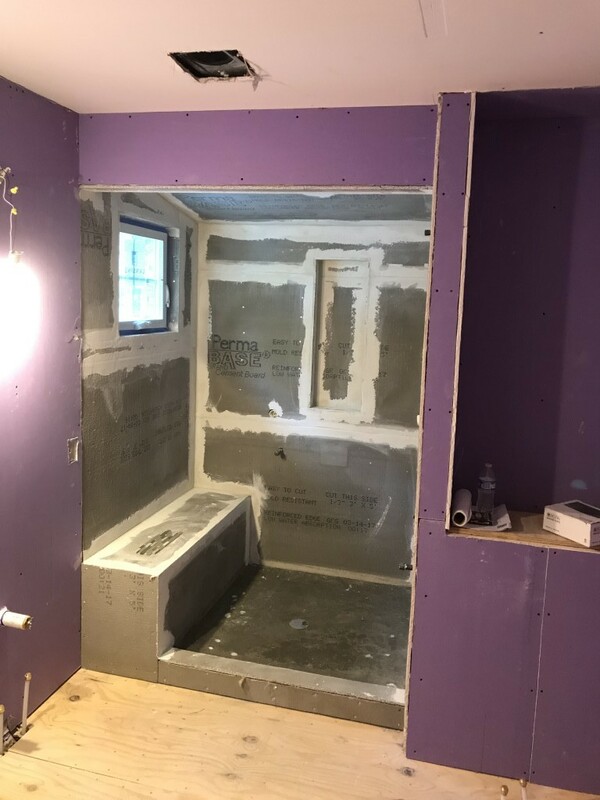 Next, you can see the sheetrock is all in place, and the shower enclosure has cement board. 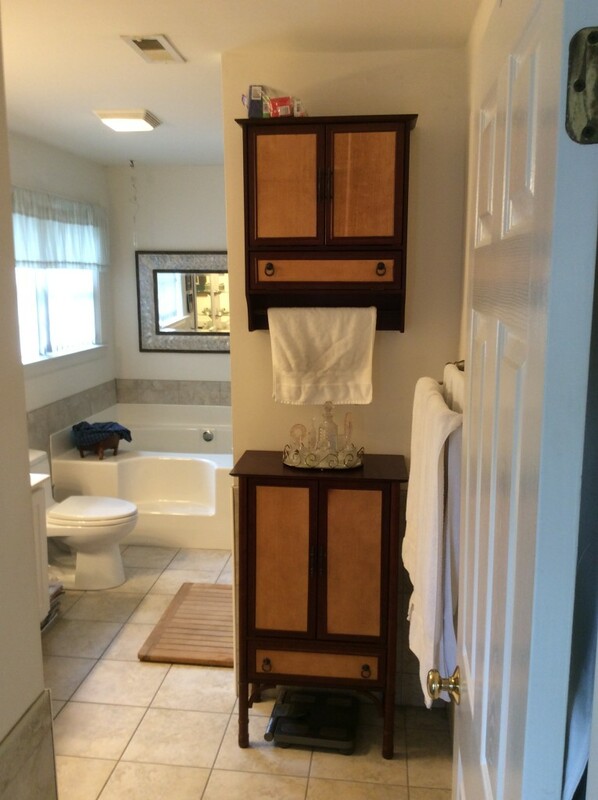 Notice the inset soap and shampoo shelf in the shower. This is a common feature we’re putting in a lot of bathrooms now. 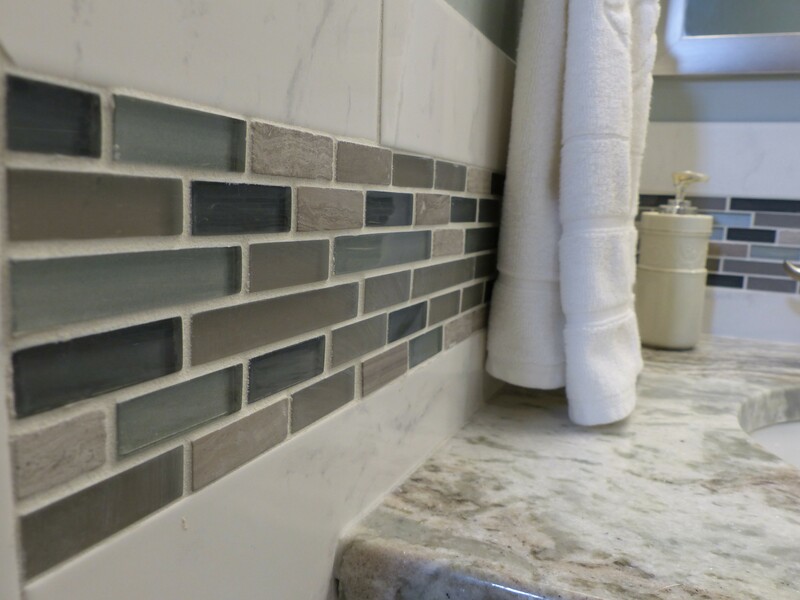 Its a nice, upscale feature that does not add too much work, so why not incorporate it into your bathroom remodeling project? 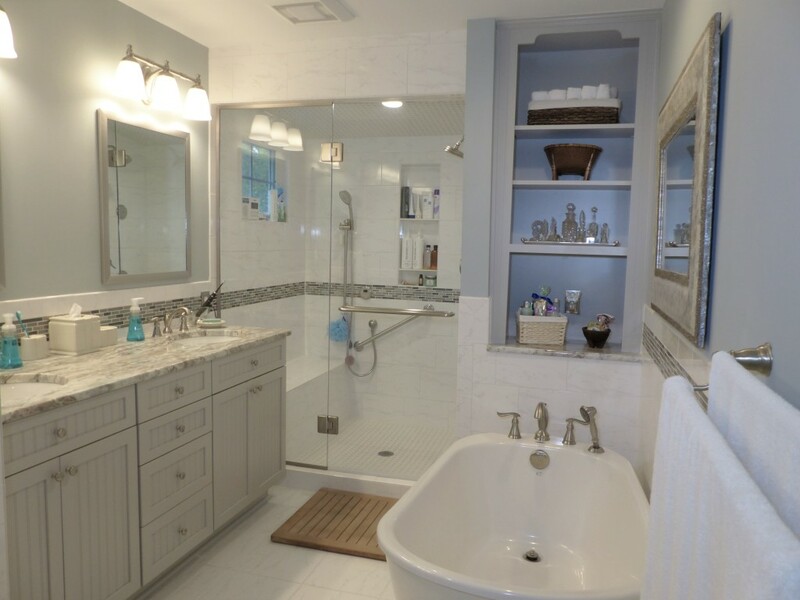 Curious about the dynamic transformation that can take place by remodeling your bathroom? Start your remodeling project today! 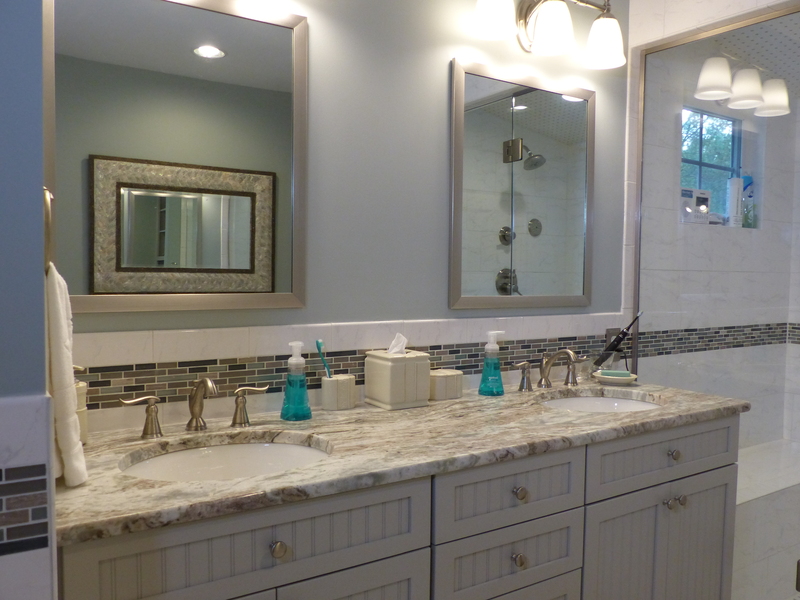 Our client’s master bathroom is completely remodeled and the finished result looks amazing. The R.J. Tilley team turned this master bath from an outdated, partially functional space into a modern master bath retreat. The after photos are jaw-dropping! Complete with storage cabinets and drawers, the vanity is not only eye-catching, it’s useful! The countertops are a popular shade of granite called Fantasy Brown. This was a perfect accompaniment to the bright whites of the new shower and bathtub, and harmonize well with clean look of the finished space. 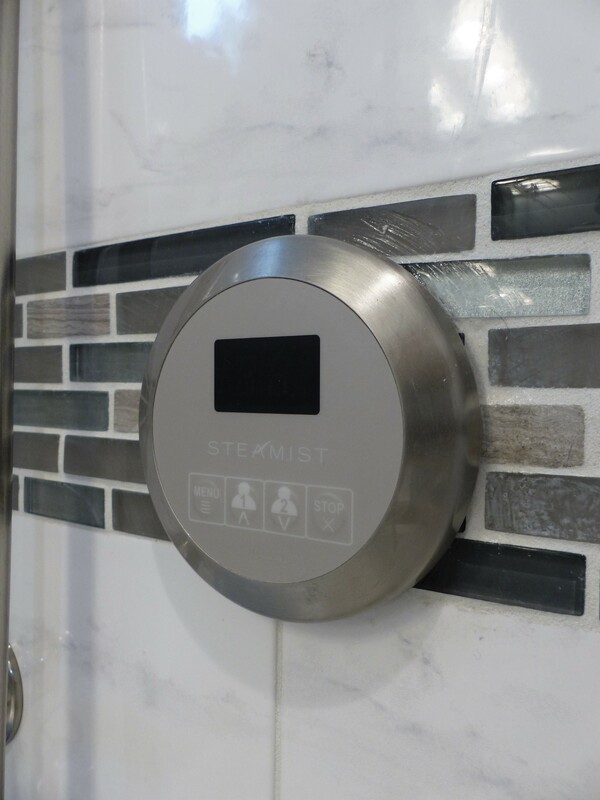 The new steam shower has dual controls, one inside and one outside of the shower. 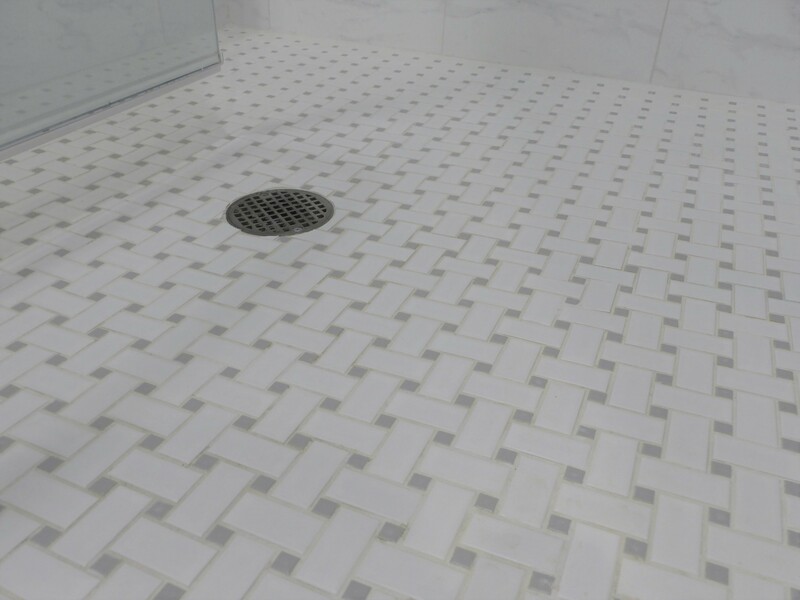 Notice the classic basket weave tile on the shower floor AND ceiling. There are multiple shower jets and a handheld sprayer, too. The freestanding tub fits perfectly in its place, and guess what? It gets used! 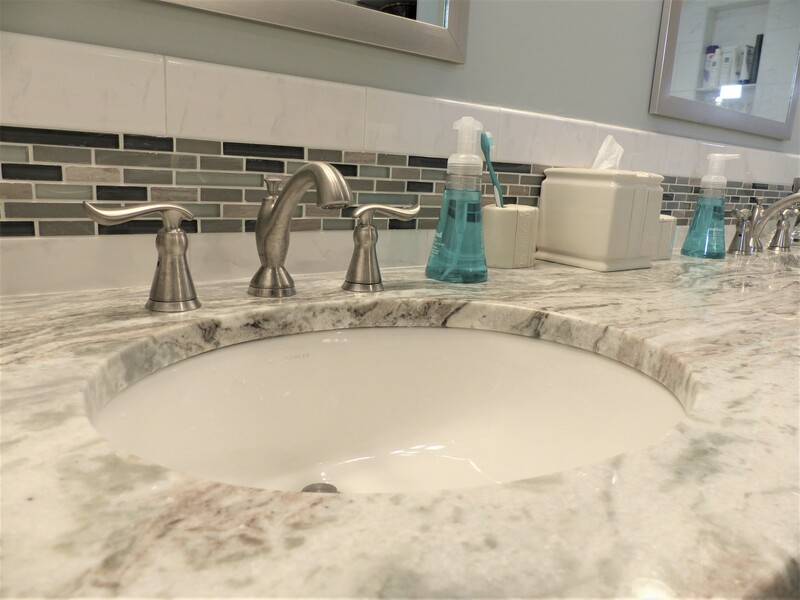 Sink fixtures don’t have to cost a fortune to look high quality. These brushed nickel faucets and handles make a subtle statement and pair well with the contrasting accented tile backsplash. 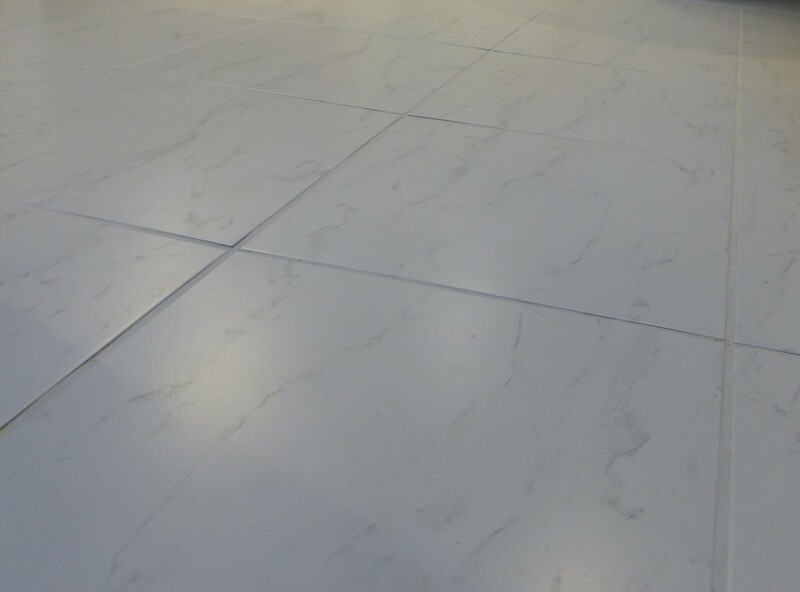 The tile floor is electrically heated, and digitally controlled (see the LED touchscreen control panel below). 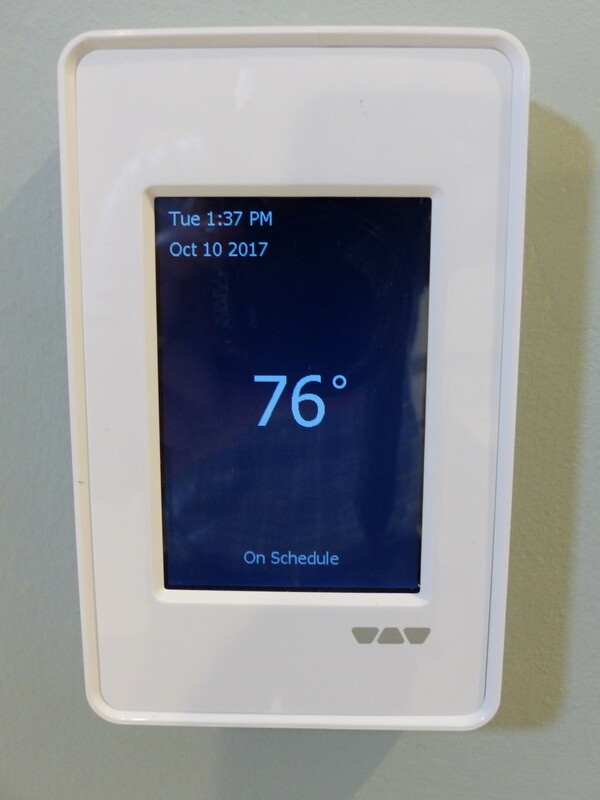 The floors can be programmed to warm automatically whenever the homeowner wants. No more cold feet in the morning! 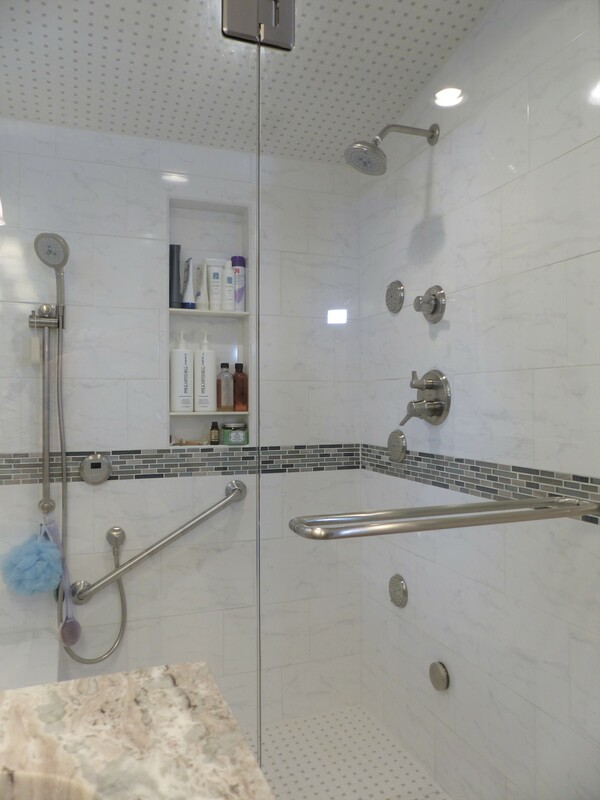 This bathroom remodeling project is proof that you too can turn your outdated master bathroom into a fully functional, spa-like retreat and what’s even better is that with R.J. Tilley you can do it on a budget. 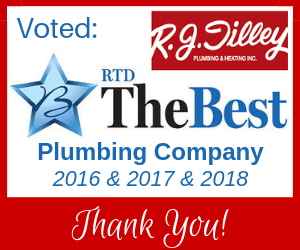 With our full staff of designers, plumbers and carpenters, we’ll work together to carry out a master bathroom remodel that meets your needs and price point. Home remodeling doesn’t have to be overwhelming. Visit our showroom to talk with one of our experts and tell us your vision! To learn more about home remodeling, contact R.J. Tilley today!